The 2015 show will feature a 20-man Battle Royale, "with wrestlers and comedians battling to be crowned champion." 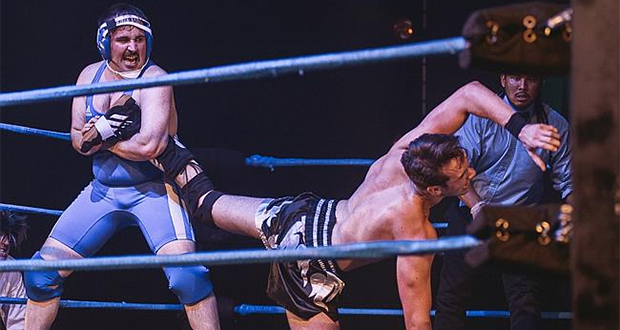 Max and Ivan’s The Wrestling is to return to the 2015 Edinburgh Fringe Festival. The Foster’s Edinburgh Comedy Award Panel Prize-winning show will once again pit comedians and wrestlers against each other in the ring. Having proved a hit at last year’s Melbourne International Comedy Festival, The Wrestling will return to the Pleasance Grand on 18 August 2015. The show is the brainchild of Foster’s Edinburgh Comedy Award Best Show, and Barry Award-nominated, sketch duo Max and Ivan. At the age of 15 Max Olesker became the youngest professional wrestler in the UK, under the name Max Voltage, and in 2011, alongside sketch partner Ivan Gonzalez, launched The Wrestling, combining punch-lines with clothes-lines to universal acclaim. Now in its third year, the 2015 edition of The Wrestling will feature a Battle Royale match as its main event, with 20 wrestlers and comedians battling to be crowned champion. The night will also see the culmination of the bitter, 5 year-long feud between Max and Ivan themselves, as they go head to head in a one-on-one grudge match. Further comedians and wrestlers are to be announced shortly. 2013’s The Wrestling II featured Ardal O’Hanlon, Tim Vine, Nick Helm, Matthew Crosby, Tom Rosenthal and commentators Brendon Burns and Andrew Maxwell. As well as bagging Foster’s Edinburgh Comedy Awards Panel Prize, The Wrestling was also named Chortle’s Best Show of 2011, and went on to be nominated for the Innovation Award at the Chortle Awards 2011. The Wrestling, Pleasance Grand, 18 August 2015, 11pm, tickets available online.